One of the coolest new possibilities arriving along with HTML5 was the Worker interface of the Web Workers API. Beforehand, we had to introduce some tricks to still present a responsive website to the user. The Worker interface allows us to create functions that feature long runtime and require high-computational effort. Furthermore, Worker instances may be used simultaneously giving us the possibility to spawn as many of these workers as we desire. This is a valid question. Historically, the ability to spawn threads provided an elegant way to partition the work within a process. The operating system is responsible for scheduling the time given for each thread, such that threads with higher priority and more work are preferred to low-priority idle threads. Over the last few years, simultaneous multi-threading (SMT) has become essential to access the computing abilities of modern CPUs. 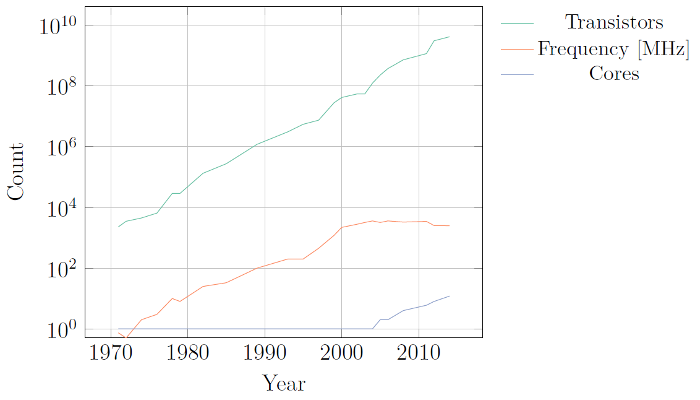 The reason is simple: Moore’s law is still valid regarding the number of transistors per area. However, frequency scaling had to stop for a number of reasons. Therefore, the available transistors had to be used otherwise. It was decided that architectural improvements (SIMD, for example) and multi-cores represent the optimum choice. where N is the number of parallel workers (for example processors, cores, or threads) and P is the parallel fraction. In the future many core architectures which rely even more on parallel algorithms might be used. In the area of High-Performance Computing GPU systems and special architectures, for instance the Intel Xeon Phi, represent such platforms. Finally, we should distinguish between general concurrent applications or algorithms, and parallel execution. Parallelism is the simultaneous execution of (possibly related) computations. In contrast, concurrency is the composition of independently executing processes. With the introduction of the Worker interface, an elegant solution to this problem has been found. From the point of view of our main application, the code in the web worker should be treated as a concurrently running task. The communication is also performed in that manner. We use the messages API, which is also available for communication from contained websites to a hosting page. For instance the following code responds to an incoming message by sending a message to the originator. Theoretically, a web worker might also spawn another web worker. However, in practice most browsers forbid this. Therefore, the only way to communicate between web workers is over the main application. The communication via messages is performed concurrently, such that there is only asynchronous (non-blocking) communication. At first, this may be odd to program but brings several advantages. Most importantly, our code is supposed to be race-condition free! Now we only need the following code in our main application to start the background worker. Can’t a library help us here? This is where ParallelJS comes into play. It provides a nice API for some convenience along with web workers. It includes many helpers and highly useful abstractions. We start by supplying some data to work with. The data field yields the provided array. Nothing “parallel” has been invoked yet. However, the instance p contains a set of methods, for example spawn, which will create a new web worker. It returns a Promise, which makes working with the result a breeze. The problem with the code above is that the computation won’t be really parallel. We only create a single background worker that processes the whole data array in one sweep. We will obtain the result only if the whole array has been processed. A better solution is to use the map function of the Parallel instance. In the previous example the core is quite simple, potentially too simple. In a real example lots of operations and functions would be involved. We can include introduced functions by using the require function. The reduce function helps to aggregate the fragmented results to a single result. It provides a handy abstraction for collecting subresults and performing some action once all subresults are known. ParallelJS gives us an elegant way to circumvent many problems that may occur when using web workers. Additionally, we obtain a nice API that holds some useful abstractions and helpers. In the future further improvements could be integrated. Until that point in time, ParallelJS is our best shot at unleashing the power of multi-core CPUs for tackling long-running computations.